Most of us will spend a lot of time dissecting the minutiae of what weapons we should carry for self-defense and SHTF prep. We’ll research for hours and hours what calibers are best and what gun are most reliable. We’ll pour over knife grinds, designs and blade steels. We will even delve into the sometimes odd world of special purpose or primitive weapons; bows, spears and so on. But one category of weapons you have likely neglected is that of improvised weapons, things used as weapons that were not designed as such. Improvised weapons are a vital brick in your survival foundation since their very nature means that they can go, and be found, where other weapons cannot. All you need to turn innocuous items in your vicinity or in your pockets into terrifying and effective weapons is a little bit of patience, preparation and ingenuity. In this article, we’ll be delving into the sometimes sordid world of improvised weaponry. Why are Improvised Weapons Skills Important? For the same reason conventional weapons skills are important: weapons increase the effectiveness of your defense and offense. Where improvised weapons have a huge advantage over conventional weapons is that they are completely innocuous prior to assembly or extremely difficult to mark as weapon, depending. Improvised weapon skills can come in handy whenever you are in a place or country where weapons are outright banned or extremely tightly controlled. You need not go through the hassle of even attempting to bring your weapons with you or procure traditional weapons on site. With a little bit of know-how and a firm commitment to inflicting mayhem, you can fashion some devastating items out of materials and items common the world over. A great benefit if you are travelling in totalitarian states or countries where subjects are lorded over by Big Gov’t Nannies, but what about situations closer to home? What about simply working in a building where weapons of any kind are strictly forbidden? Knowledge of how to grab an item that will make a great weapon when seconds count could spell the difference between life and death. Or worse yet, if you are kidnapped or held against your will knowing how to make a weapon from any innocent detritus or material nearby is crucial to have a fighting chance against your captors. The bottom line is that improvised weapons construction and techniques are both important skills for every citizen in these trying, crazy times we live in. What is a weapon? A weapon is a tool for harming or killing. Beyond that: what part of the weapon does the killing, does the harming? A principle, a concept. Something that pierces. Something that crushes, or cuts or bursts or burns. Purpose made weapons, be the swords or spears or arrows or guns are only highly refined and convenient ways to bring those principles to bear on an adversary. When you start thinking more about weaponry in this abstract way, you will begin to notice entirely new avenues to deliver injury and force to an attacker. Knives can cut, but what is a knife but metal sharpened to an edge? What other edges are handy? How might I produce an edge quickly? This is the cornerstone of improvised weapon methodology. From this understanding, you can start to learn what common, everyday objects are best suited to such work in a weaponized context, and how you can assemble your own proper, if primitive weapons from common materials. Either can be devastating, especially if deployed with the element of surprise. 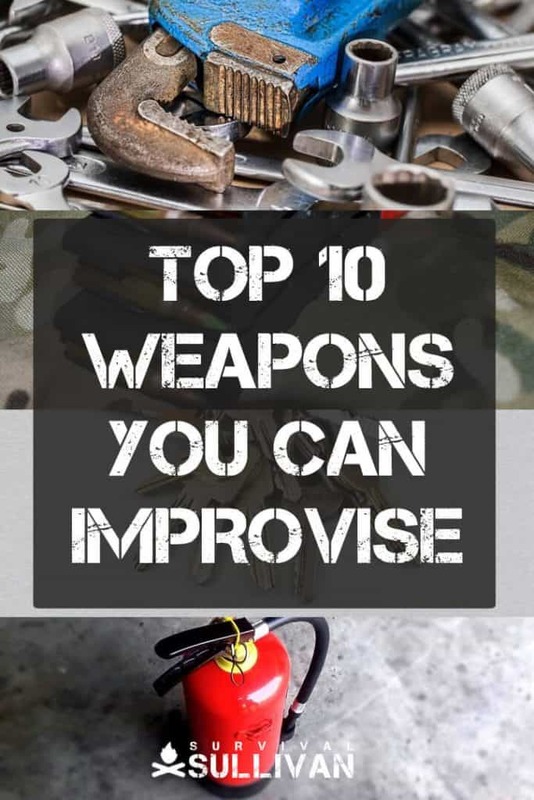 Improvised weapons usually fit into two broad types, the first being everyday objects that you can wield as weapons and the other being intentional weapons you assemble or craft. Both have advantages, and you should be familiar with each. Everyday objects that you wield as weapons are ready to pick up and use, be it a poke, slash, bash, throw or something else. Knowing what objects make the best improvised weapons in any given setting, and how to employ them best, is a big part of competency in this sector. Anywhere you find yourself, from an office building to a gas station has its own typical improvised weapons. Observation whenever you enter a given place will highlight at least one or two items that are suitable for use as weapons. This is important not only for your potential use, but also to guard against their potential use on you; not all criminals are brain-dead brutes. Many of them have honed and practiced their skills in a sort of dark reverse image of yourself and other good guys. They may very well be crafty, and go about without weapons but never have one far from reach. The other variety of improvised weapons, ones made or crafted with a purpose, may be more effective and ergonomic than their found-object kin but also run the risk of being identified for what they are; primitive technology is still technology and if you are in an area with strict laws on weapons you could run afoul of them if detained and searched. That being said, crafted improvised weapons often have the durability and ergonomic advantages to stand up to multiple blows or fights, an important consideration if you are facing a serious situation that may become protracted. Below you will find a list of 10 devastating, effective and easily procured or produced improvised weapons to suit any need. We have both varieties represented on our list along with instructions for their making and use. A fist load is any weighted object held in the hands to increase the power of a punch, and ideally reduce injury to the puncher’s hand. The old ne’er-do-well technique of palming a roll of quarters or nickels before socking the unwary with an alloy-backed haymaker is an old and infamous one. This variation gives the old trick a lethal new twist. First, procure a roll of quarters. Grip the roll and using a pen or nail tip mark the roll between each finger. Next grab three nails, about 3” to 4” long. Next remove about 6-9 quarters depending on the thickness of your nails. Carefully, and paying attention to keep them straight, centered and plumb, drive the nails through the roll of quarters making sure to have some coins on both sides of each nail for support. If time permits, you can wrap the roll with duct tape to reinforce it. Now grip the roll so that a nail protrudes between each finger, akin to Wolverine’s claws. A punch will now inflict terrible penetrating wounds or lacerations. The great thing about this weapon is that a roll of coins is easily explained away as change for phones, tolls or vending machines, and nails are common enough to hide in any tool box or trunk. Another classic that hails from countless cities in innumerable gang fights and biker brawls. One needs only to procure a length of stout, thick chain, a bit longer than your forearm. Affix a weighty padlock to the end and swing away. The force generated by even a small lock on the end of chain when whirled and swung can shatter bones with ease. Locks and chain is available literally everywhere on earth, and this combo can be crafted in seconds. You do need room to swing it, so skip this one for encounters in built-up or crowded areas. But on the streets, this one is gold. A length of chain and lock, even assembled can be explained away as being for a bike, moped or motorcycle, or for a gate or fence in more rural locales. Good clubs abound everywhere, but the best kind, be they sports bat, pipe or sturdy lumber are hardly inconspicuous outside their expected environments. That’s where the humble magazine comes in. A sturdily bound magazine rolled very tightly becomes shockingly dense, and will easily deliver a knockout blow to the head of an attacker. If you have time, you can tape the ends to improve durability, or load a small pouch of “shot” (any small, weighted material like lead shot, small coins, pebbles, etc.) into the end for even more molar-rattling impact. So many things can be sharpened to a point. A stabbing weapon is one of the most common on earth. With some creativity and a little time, you can turn out a weapon capable of piercing an attacker’s soft parts with ease. Compared to forming an edge, getting an implement sharp enough to pierce is a simple affair, and can be made as simply as cutting an end off a tube at an angle. Consider a few of these ideas: procure an appropriately shaped antler tip from a hunter’s trophy, or a pair of lure antlers; cut the end of a clear, hard pen tube off, and leave the guts of the pen out; shape and sharpen a soft piece of metal rod on pavement, or using sandpaper. The opportunities are endless. Once you have a point to get across, simply create a handle, if needed, from whatever you have. Tape, cloth, even paper are all adequate handle materials. Like the ninja of the ancient Far East, you too can disappear from sight in a burst of smoke. Sort of, anyway, and you may permanently blind an attacker to boot. This weapon can be crafted in a handful of different ways: one can use, painful, but ultimately less dangerous materials, or go all out on the ingredients for maximum effect. For the first, procure common condiments like crushed red pepper, fine back pepper, and the like. Hotter the better. Mix these in quantity. Strong liquid agents can also work, but transporting them is harder. For the latter, we are going to get nasty: take glass light bulbs and crush them very finely, gather metal shavings and filaments, and similar fine, light, hard materials and mix them together. EXERCISE CAUTION: if you get this hellish mixture in your eyes, you can kiss your sight goodbye. Whichever you choose, pour them into a quick open capsule or container for use. This could be something like a cut in half and cut down water bottle overlapped, a container from a kids’ toy dispenser or something similar. 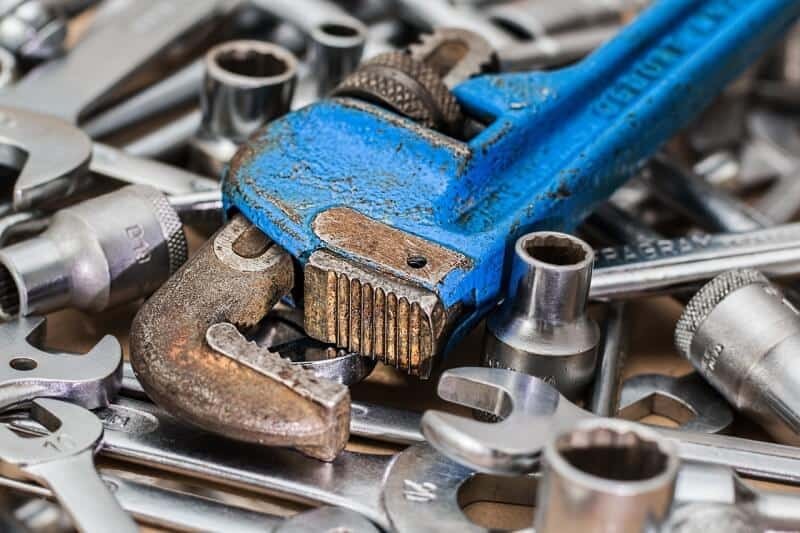 A wrench is less overtly threatening than a hammer, and less likely to snag thanks to its lack of nail pulling claw. A hefty pipe wrench may as well be a mace for all the impact it possesses. These are common at every hardware shop and home improvement store, as well as garages and plumber’s vans. One of these carried with a can of silicone, thread tape, and other miscellanea provide ample cover for the wrench’s presence. A fire extinguisher is one of the best improvised weapons inside a building for one reason: range. A fire extinguisher will emit a pressurized, blinding, choking stream of chemical reliably and for a short duration, making it excellent for degrading the vision of or even incapacitating an attacker. You can use the opportunity to get away or bonk them in the head with the now-empty can. Take care that your extinguisher is not a water-only can, or you’ll end up looking like a sad clown playing a sad joke right before you get machinegunned with an AK or hacked with a machete. A thick, hefty tome will make for interesting reading and surprisingly sturdy offensive and defensive tool. A larger book can be used a sort of shield, though not a perfect one, but it has the heft and aerodynamics to be a good distraction if thrown or a potent impact weapon. Hint: you can whack with a book as you would a rolled-up magazine, but you will have better results with something else. Instead, drive the edges of the book forcefully into your attacker, especially if he is already down. This guillotine-style attack produces surprising amounts of force. A sturdy, locking steel carabiner makes for a good improvised set of knuckles, and are used effectively with overhead pounding and hammerfist strikes. The ubiquity of such devices for utility and sporting purposes makes these easy to carry and explain. Take the time to choose one that is rated for strength, and fits your hand reasonably well, or else you run the risk of more significant injury when striking. Again, this must be a locking version or you run the risk of impalement. 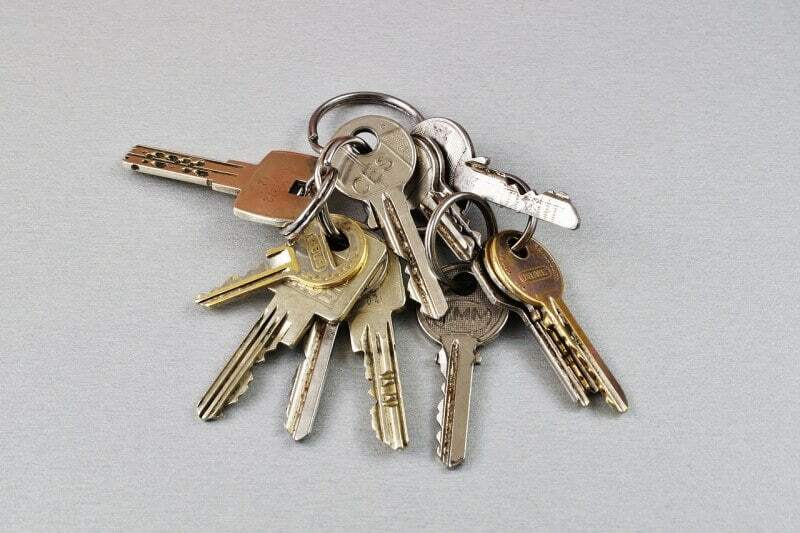 An oldie but a goody: if you have a traditional key ring with plenty of keys on it, you can load it into your fist with a key protruding between each finger. This can enhance strikes to an attacker’s soft tissues, especially their eyes. An easy way to enhance this technique is to add a soft woven keychain made from paracord or similar material and use it as a sort of handle or soft backer for the keys. This will increase stability and help prevent the base of the keys from puncturing your hand when you strike. Hot Coffee, Tea, Soup, etc. – If you are close enough to a piping hot vessel of liquid, launch it into your attacker’s face. Table or Chair Leg – A sturdy member from a table or chair, wood or metal, can make an excellent club. Glass Bottle or Cup – A classic barroom implement, a thrown glass or swung bottle makes for a one and done attack, but can inflict gnarly lacerations with ease. Heavy Paperweight – Any small, dense and angular object and can be driven into an attacker’s skull with good effect. Belt w/ Buckle – A belt with a metal buckle makes for a good flail. One full revolution before striking can make for a brutal impact that can crack bone. Flashlights. A solid Maglite can cause serious injury to your attacker. For even more ideas, check out this other list of part-time self-defense weapons you can find around the house. Improvised weapons techniques are an important part of being truly prepared at all times and in all places. Face it: you just will not be able to keep your weapons of choice on you at all times, everywhere, every day. Knowing how to make the best use of common items or craft effective weapons from innocent components can keep you armed to the teeth no matter where you are. Tom Marlowe practically grew up with a gun in his hand, and has held all kinds of jobs in the gun industry: range safety, sales, instruction and consulting, Tom has the experience to help civilian shooters figure out what will work best for them. Next Should You Carry Extra Ammo for Your EDC Handgun? An obvious improvised weapon not mentioned is a newspaper or magazine rolled up tightly. Use its blunt end to thrust into the ribs or solar plexus to disable the largest person. A blow to the “Adam’s apple” in the throat will collapse the larynx, cause swelling and block the airway effectively choking an attacker to death. Maybe not Improvised, in the strictest sense, is a cane. Good canes can be found that are very sturdy. Of course, if you are a 200 pound bodybuilder, it would look out of place. But for us “old farts” it would fit right in. I’m a paranoid individual by nature so I think about this quite a lot. For a quick improvised weapon I’m a big fan of a regular old tube sock. I keep my old ones to use as shop rags. Sock plus the padlock on my tool box makes a slock. Has enough reach to keep an attacker at arms length and the bonus of weight to seriously mess someone up. Plus socks are all over the house. Bedroom, hamper in the bathroom downstairs in the laundry room and sometimes in the living room. All that’s really needed is a weight. Lock handful of change bar of soap a few batteries ice cubes an apple will do a surprising amount of damage. In my own self or my family’s defense anything I can get my hands on can become a weapon also remember that there is no such thing as a fair fight. I really like the fire extinguisher idea because of safety laws they are everywhere in the states. Wasp spray to the face. 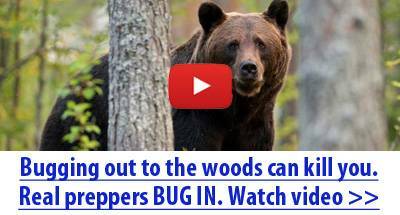 15 to 20 foot range of caustic liquid to stop a bear or attacker. Hey R. Lockey: Did you miss something, like #3 of the list, maybe you should read it again. Hey Ronald, I would not use wasp spray if you have access to proper defense sprays. I don’t know how this got started in prepping circles, but wasp spray is design to attack the biology of wasps, not mammals, and is nowhere nearly as effective as OC. Why would you choose bug killer over a purpose-made product? I’d use a can of wasp spray if it was the only implement I had at hand (and then I’d pray for the best) but I would never, ever choose it over pepper sprays.